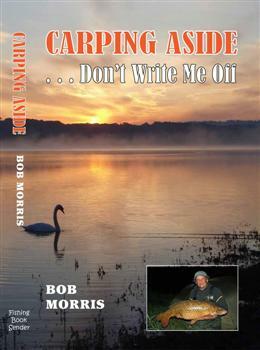 This beautifully presented tome contains many anecdotes and glorious images from well respected angler Bob Morris across more than two hundred and fifty pages. Available as a 'standard' hardback, special edition and leather bound, the volume is sturdily bound, and the heavyweight pages are filled with prose inked in clearly readable text. Every image which accompanies the script is annotated to describe the capture or surroundings which the author describes and is completely appropriate to each chapter. A ribbon becomes the readers 'reminder' and (hardback edition) a durable dust jacket protects the inlaid embossed emblem of the publisher to keep the book in pristine condition. There are tales of childhood reflection. Travels to the waterside in a neighbourly angler's Ford Popular, visits to tackle emporiums full of mystique and the excitement of that first fish all have their place, but it may be references just as familiar which really take the reader back to their own earlier experiences. Mere mentions of tackle long forgotten do much to transport the avid student back to times when angling seemed so much simpler; Sealey Speedbarb??Slycast? Heron? How about Intrepid Regent?? Each is lovingly remembered as are recollections of summer evenings waiting in anticipation of the glorious sixteenth, inlaid with classic quotes which refer to waiting with "...bated breath and baited hook" or descriptions of pike as ".....surfacing like a wounded U-boat" and others to which we can all relate. Meetings with Fred Wilton, explanations of the HNV theory and subsequent success fill a number of pages which the modern carper will absorb in awe as the progression from potato and free lined bread baits to the modern boiled concoctions of today are revealed. The reflections where much is learned from Wilton and the snaffling of a few pieces of kindly offered 'special' baits, the sessions alongside his hero and the capture of fish which resulted are all recreated in detail; beautiful to read and even better to imagine! Bob Morris Tackle, not just a shop, but an extension of the Morris rod building enterprise for which the author rapidly gained repute, provides a plethora of characters to which merry sketches are applied. Each is portrayed both as comrade and worker, idiosyncrasies defined and amusing moments articulated, but it may well be the underhand tactics employed by competitors which provoke most insight. Accounts reduced or removed, materials unobtainable, mistruth and subterfuge are all evident as success breeds jealousy by those once regarded as colleague or friend; intriguing indeed. Morris recounts all, and decides that the tackle trade hasn't changed much over the years; those who know the trade will agree, those who don't will be enlightened! Limited Signed hardback copies in stock available - Please ask when ordering. 35 leather bounds (£220), 35 special hardbacks (£85) and 450 hardbacks (£30).All plus P&P. A few leatherbound editions and Special Hardback editions still available.We have decreased the limitation to 35 of each.